While BRAC is closing most buildings on Fort McPherson and Fort Gillem, in one instance, it has led to an expansion. 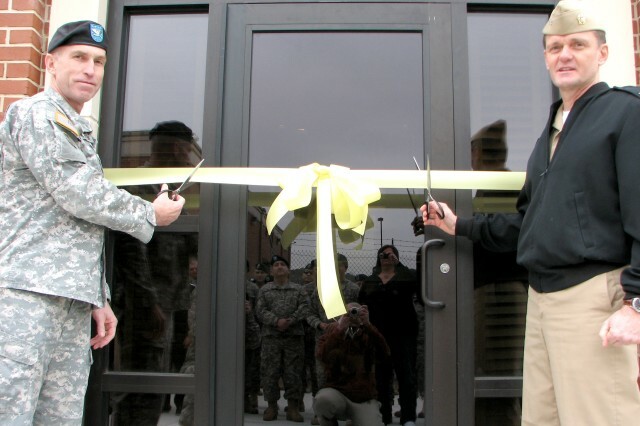 On Jan. 20, staff members at the Southeastern Army Reserve Intelligence Support Center (SEARISC), Bldg. 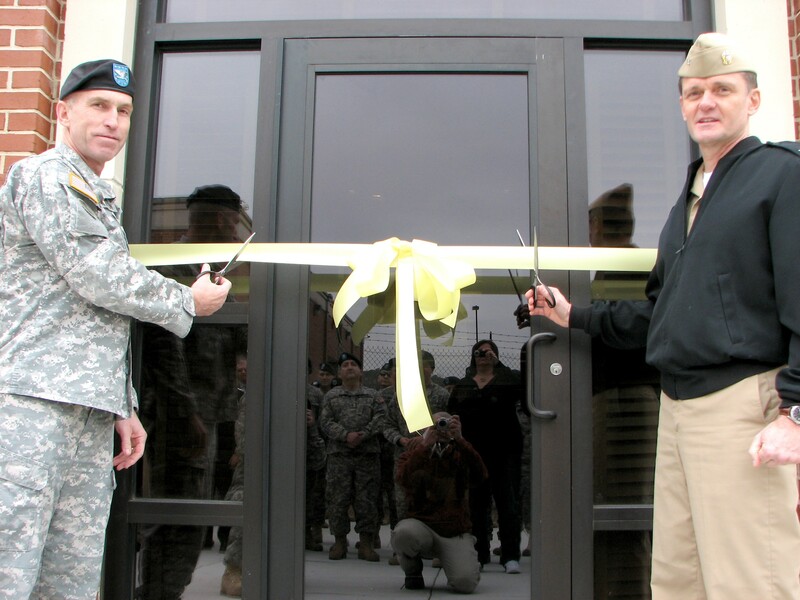 839, on Fort Gillem hosted a ribbon-cutting ceremony to open a new annex to their building. The 8,000-square-foot addition to the existing 20,000 square feet represents a significant change to the structure of the SEARISC, said Lt. Col. Joel Harbaugh, SEARISC commander. "This will expand our capabilities to support joint intelligence production and training missions," he said. The $2.6 million investment does so by providing additional space to house DoD Civilian employees and members of all services necessary for completing the SEARISC mission, Harbaugh said. Before the annex, the joint service center was separated, in that units were spaced apart from one another, hampering their ability to perform the mission of fusing intelligence sources from different sources and providing such intelligence to all major military commands, said Capt. Gene Price, Naval Intelligence Readiness Reserve Southeast (NIRR-SE) commander. NIRR-SE was one such unit separated from SEARISC. Housed at Naval Air Station Atlanta, which is closing this year, the unit will now be able to work closer with SEARISC, Price said. "Now we're really joint," Price said. "It will be an enormous benefit." Such a benefit will be felt by more than SEARISC, Price added. "The work done here impacts the world. Now the government has made it even better," he said. The betterment will be felt by providing necessary space to house administrative support staff and room for training, Harbaugh said. "An intelligence unit needs to have staff support. This will assist in good unit function," he added. Having room to train servicemembers will ensure they are adequately prepared to deploy and be more efficient while deployed, Price said. The benefit will not only pay off in terms of accomplishing the mission: in a time when budgets are at the forefront of the news, the investment will pay off monetarily, said Harbaugh. Instead of managing multiple facilities, DoD will eventually save money by only having to operate one, Harbaugh said. It will also cut down on administrative operating costs and travel costs of moving multiple personnel to and from separate locations, he added. "I'm confident this annex will prove to be an invaluable asset," Harbaugh said.